Brugge is the capital and largest city of the province of West Flanders in the Flemish Region of Belgium. It vies with Amsterdam, which is much larger, as "The Venice of the North". It is a very small and pretty self-contained medieval city interlaced with canals. If you are using the ferry make it a must one way on your journey. If on a cruise, and Zeebrugge is a popular port of call, sign up for the day trip. 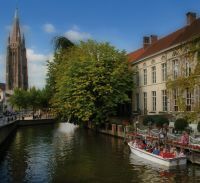 Coach tours from the UK take it in, and if on a touring holiday of the Low Countries make sure Brugge is on your itinerary. Take Eurostar to Brussels and change on to the local train. Brugge Station is a short walk from the centre. Allow for at least two nights if you can. The Middle Ages were the golden times for Brugge. The harbour was easily accessible from the sea and the merchants prospered. Woollen weaving was a major industry and it was also the home of financiers (the world’s first Bourse was created in the city) and artists. The first book in English ever printed was published in Brugge by William Caxton. Kings sought refuge in the city. Edward IV and Richard III of England spent time in exile here. At one point it was considered the "chief commercial city" of the world. 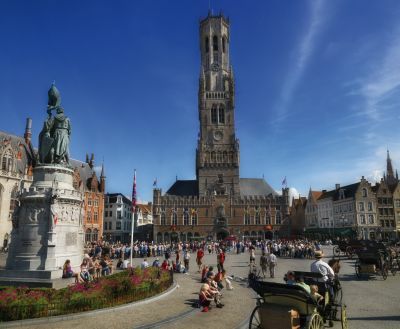 Brugge's most famous landmark is its 13th century belfry, housing a municipal carillon comprising 48 bells. The city still employs a full-time carillonneur, who gives free concerts on a regular basis. Many of its medieval buildings are notable, including the Church of Our Lady, whose brick spire reaches up 400ft making it one of the world's highest brick towers/buildings. The sculpture of Madonna and Child, which can be seen in the transept, is believed to be Michelangelo's only sculpture to have left Italy within his lifetime. Other famous buildings in Brugge include Saint Salvator's Cathedral and the City Hall which overlooks the fine main square. Brand new is the Historium Brugge an all-encompassing tourist attraction where sets, film, music and special effects merge into what is a magical experience. There are seven themed rooms. Brugge also has a very fine collection of medieval and early modern art, including the world-famous collection of Flemish Primitives. Various masters, such as Hans Memling and Jan van Eyck, lived and worked in Brugge. 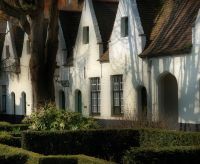 Brugge also has a béguinage, or nuns’ area, a small gated section of the city, a refuge for women who sought in their way to serve God without withdrawing from the material world. The gates are closed at dusk.